Spa jets and spa jet fittings comes in a variety of styles, sizes, configurations and colours. ELM distributes and ships Waterway jets as well as American Products, Pentair, HydroAir, Jacuzzi, CMP (Custom Molded Products) and Rising Dragon jets and parts anywhere in Canada. Deluxe series, 5-point scallop-textured, mini jet body and internal assembly, 5-point scallop - textured large face, smooth face jets, poly jet internals standard, poly jet internals deluxe, poly jet internal 5-scallop. ELM also ships jet bodies which are available in straight body, elbow body or tee body configurations. Spa jet fittings made by Waterway Plastics are created by injection molding. 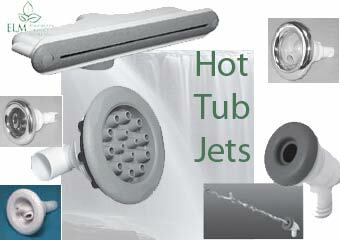 Water way produces spa and hot tub replacement jets, valves, skimmers, drains and other reliable spa parts. Determine if it is only the jet insert or both jet insert and jet body that needs to be replaced. Check for correct jet size. Note jet type - such as ozone cluster jet, adjustable cluster jet, standard mini jet, adjustable mini jet, poly jets. Verify jet configuration: adjustable cluster storm jet, mini storm jet, poly storm jet, rifled, mega, extra large face, jumbo storm or other type of hot tub jet parts. Specialty spa jets include waterfalls and waterfall jets, pop-up fountain jets, flush mount led water feature jets and the 8" Aqua Fall low profile waterfall. Adjustable spa jets can be turned on and off. By rotating them to the left the jet is turned on and water flow is increased. Turning the outer ring on the jet to the right turns the jet off or decreases water flow If you continue to turn the jet face left, it will come out. Most of the time, you can easily replace adjustable jets of the same size with a different jet type or style.